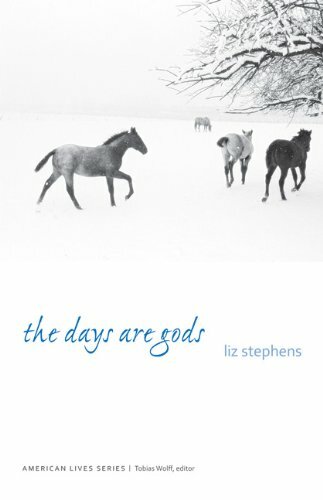 The Days are Gods by Liz Stephens. Nebraska, 203 pp. A meditative memoir with a narrative arc. Last week I got four memoirs in the mail and picked up the most celebrated. Bounced right off it. Next, I tried The Days are Gods by Liz Stephens and got hooked. That happened despite what seemed thin material: L.A.-Hollywood gal with roots in middle America sees middle age approaching, moves with her mate, an ex-actor-turned-welder, to rural Utah for a master’s program, tries to fit in and become local, struggles but mostly succeeds, has a baby, and eventually decides to move away for better prospects, not a local after all. By spring, he was a smoker again. He’d quit in L.A., and the man I married was the guy who would come home at midnight from running miles through the streets of Hancock Park, gleaming and healthy. But a winter of standing in the Rocky Mountain cold with greasy hands, surrounded by a few other guys who couldn’t get other work, friends of the boss who were drinking on the job and then welding weight-bearing structures, was wearing him down. He wasn’t adjusting the way he thought he would. He wasn’t, it turned out, loving it like I was. I was stunned. Along with Stephens’s surprisingly classical-essayistic meditative and musing bent, which in its reflection on meaning harkens back to essays’ roots in philosophy, she crafts for her memoir a relaxed forward momentum and achieves a real narrative arc. It’s a winning combination. Stephens analyzes everything she’s experiencing and thinking—as people do inwardly, though surely not as artfully—as the story ambles onward. Late in the book, when a local couple whom Stephens has idolized turn frosty because she’s leaving, it’s moving and painful to read. The truth, poignancy, and much of the payoff of her memoir reside right there. Real locals seldom write books like this, I’d wager, for The Days are Gods is a product of an outsider yearning that can’t ever be fully sated and of a self-consciousness and insecurity that seem antithetical to what what’s meant when we call someone “a local.” Then again, Stephens shows the downsides to what in America we call local culture: folks with jobs instead of careers, steeped in tradition for good and ill, wary of new ways. But locals do seem enviously planted, whereas the rest of us must labor to earn our place. Or at least inhabit, suffer, and love long enough in one place to earn the feeling that we deserve to draw breath where we do. We can only pray, as the days wash over us and the new and awkward become routine, that we continue to see what we may have glimpsed in the pain of starting over, seen what Stephens tries to show, that our days themselves are gods. The Days are Gods is a book with a lot of heart, and it’s a model for those seeking to turn their own experiences into memoir. This sounds like quite a good book, Richard, though I sometimes find a certain resistance in myself to reading about conventional or socially conservative areas like the one I was born in which I left when I went away to school and haven’t in later years spent much time in. It’s as if the experience is a little too near. Still, the fact which you tell about her going away again at the end says that there’s light at the end of the tunnel. Thanks, Victoria. I understand your position, which is really a lot of what this book is about. A wonderfully relaxed amble through this book. You just get better and better at this. I’d almost rather read your reviews than the books themselves. A high compliment, John. But trust me, my review is no substitute for the book! I’ll add Liz Stephens’ memoir to the queue of books I am anxious to read. I think it’s curling around the block now, but thanks to your review, The Days are Gods just skipped over several others and moved up in line. Your sentence about locals being “enviously planted” struck a chord with me. As Buck and I explore the tricky territory of old age, (where no one is a local), the once appealing idea of moving away from this town where his father, grandfather and great-grandfather lived, has become more complicated. It’s not the puffery of pride, but the comfort of familiarity that tugs, in knowing how to get to the hardware store on the backroads if there’s a wreck on the interstate, that kind of thing. And perhaps an inexplicable pull to have your ashes sprinkled on the camellia bush that blooms each year on your mother’s grave. It’s easier for me. I’ve been an outsider since birth, lightly perched wherever I am. Thanks for starting my day off on a marvelously reflective note. Thanks for reading and commenting, Beth. I love your line that in old age no one is a local, and it sets off fireworks of thought in my brain. So many of us are transplants, supported by even newer transplants, first generation. As both a semi-transplant in my husband’s landscape and as someone who spent my childhood on a farm that had been in my family for five generations, I found myself nodding in agreement from both sides of the “local” line. I too love Beth’s line about old age not being local and also the “lightly perched” image of place wherever we are. Richard, I agree with J.V. about your reviews. Just when I think you can’t top you last one, you do! I agree with Paulette about the “bounced right off” line referring to the more celebrated memoir. As much as I now want to read The Days Are Gods, I’m curious about why you bounced off the first one. Darrelyn, I think it was the writer’s persona in the first one and her persona in the second that pulled me me. Just . . . personality. I didn’t want to spend time with the first and did with this one. Thanks as well to Shirley and Paulette, on the review compliment. I just wish they were easier to write; I find them very hard. A wonderful review. Interestingly, I picked up this book the other day and my immediate reaction was like yours, the material is too thin, too naive I told myself. But, like you, there is something about the author’s voice that is pulling me into the story and the countryside, even though I grew up in the West with cowboys and ranch hands. I think I will read it straight through because t I am enjoying her voice. Great, Morgan! Please stop back by and let us know what you think.